21 October 2009, Obertshausen - Although the roots and applications for lace fabrics are fairly constant, their appearance and the technologies used to manufacture them vary considerably. One company which understands this very well is Spiga GmbH, a family company and commission lace manufacturer based in the Saxon town of Flöha. Leading raschel lace machine builder Karl Mayer says that Spiga has consistently pursued a strategy of using only ‘state of the art’ lace manufacturing technology to service its many and varied international clients. Since its foundation in 1993 Spiga GmbH has constantly invested in the extension and modernization of its machine capacity and has worked closely with Karl Mayer in this respect. Karl Mayer says that the company has a readiness to innovate which is paying off and with thirty high-tech lace machines at its disposal and an annual capacity of more than 180 tonnes of lace; the company has established itself as one of the leading lace producers in Europe. Spiga was awarded a prize by the regional magazine 'An Oscar for medium-sized firms' in 2002 for its excellence in lace manufacture. Today Spiga produces at a new manufacturing unit at the company’s Flöha/Falkenau site and is continuing with its expansion policy. The company’s latest acquisition is a Karl Mayer TL 71/1/36 Multibar-Jacquard Raschel machine for the production of high-quality elastic and inelastic lace fabrics. 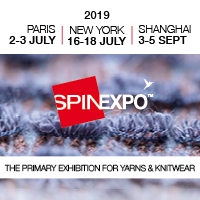 According to Karl Mayer, Spiga decided to invest in its new Textronic Lace machine in order to be able to translate the increasingly diverse design requests of its customers even more efficiently and to give itself options into the future as well. Karl Mayer says that the TL 71/1/36, with more than six strings behind the fall-plate, gives a 40% increase in efficiency over the earlier multibar Textronic models. In order for Spiga to fully assess the machine, a TL 71/1/36 was installed at the Flöha factory in February 2009 and the company tested its production potential comprehensively. Karl Mayer says that Spiga’s experienced raschel lace technicians fully explored the extended patterning possibilities of the machine, tested different effects, checked fabric quality, studied how the machine handled paying attention to the efficiency, and were finally satisfied. Spiga’s new TL 71/1/36 now works on a three-shift system in Falkenau, producing typical Textronic patterns and Karl Mayer says that the Asian set-out in particular can be efficiently converted with a separable border in the middle. “Now we are coming to the point where we are developing new lace qualities,” says Spiga’s Director Nico Mach. “The TL 71/1/36 has a great deal of latent potential which we can utilize to set trends in patterning. Here I’m thinking in particular about producing functional technical effects, and the stimulus must come from the designers,” Nico Mach says. Karl Mayer says that in the translation of innovative ideas, Spiga does not just stay with what is creative and salutes the company’s knowhow and its high-tech capacity, especially its new Textronic Lace machine.